Play the weekend warrior much? I’m tight with a few cats who don the leather ensemble and pull their hogs out of the garage as soon as Saturday rolls around too, hitting the open road “Easy Rider-style”. If you ask me, there’s nothing to be ashamed of with being a wage slave all week and acting like a badass on weekends, long as you make sure to play the part. As an office rat, it may be acceptable to patch your small flesh wounds with band-aid, but it just looks silly imposed on a guy clad in biker boots, leather jacket and a 1980s Misfits shirt. Really, really silly – like, just throw yourself in the middle of the road and let the truckers run over you, you shameless clod. The Leather Band Aid seeks to bridge the gap, letting you dress that teeny wound without putting you to shame. 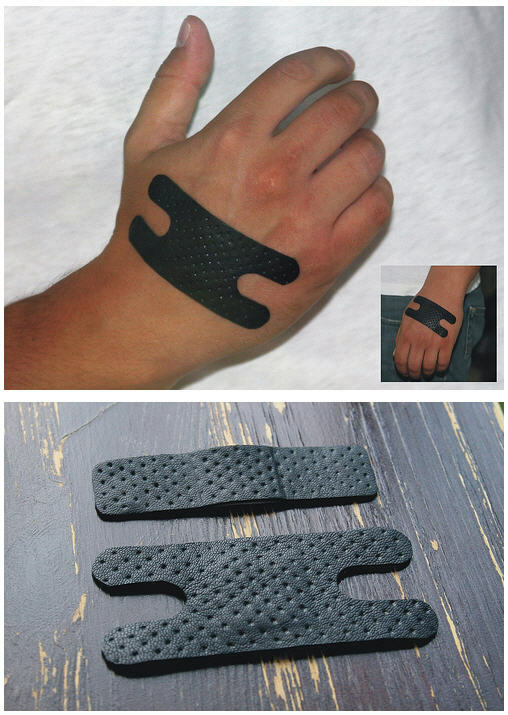 It works just like any regular band-aid, complete with a medicated gash in the middle, except the outer panel is clad in the same black leather that the rest of your ensemble is made of. That way, you can pretend that you had your mechanic friend stitch and cover the wound with whatever he can find in his garage. Less lame, more cool – the way every weekend warrior should be. Sure, you can leave that scratch uncovered (just like real tough guys do), but would you really risk getting infected with all them bacteria on the road? Especially since you’ll probably be spending time with unbathed bikers across seedy bars, using public toilets and stuff. 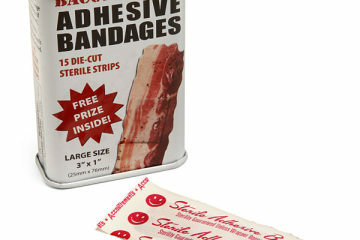 A pack of three Leather Band Aids cost $18, a nominal price for the sake of your dignity. Also available from the same guys: leather band-aids with Louis Vuitton emblems that are perfect for your label-conscious, fashion-lovin’ friends.